iFixit has got its paws on it and confirmed that it is 512KB. Gruber thinks that it is to save power. In the low-powered world, every byte of ram has a cost in battery life, even if it is idling. So there is a payoff to making things work in the 512K over 1GB. Kevin - I would say the 4S with Siri and as a World Phone is a bigger update than the Retina display and a new package - that we had when the 4 was introduced. 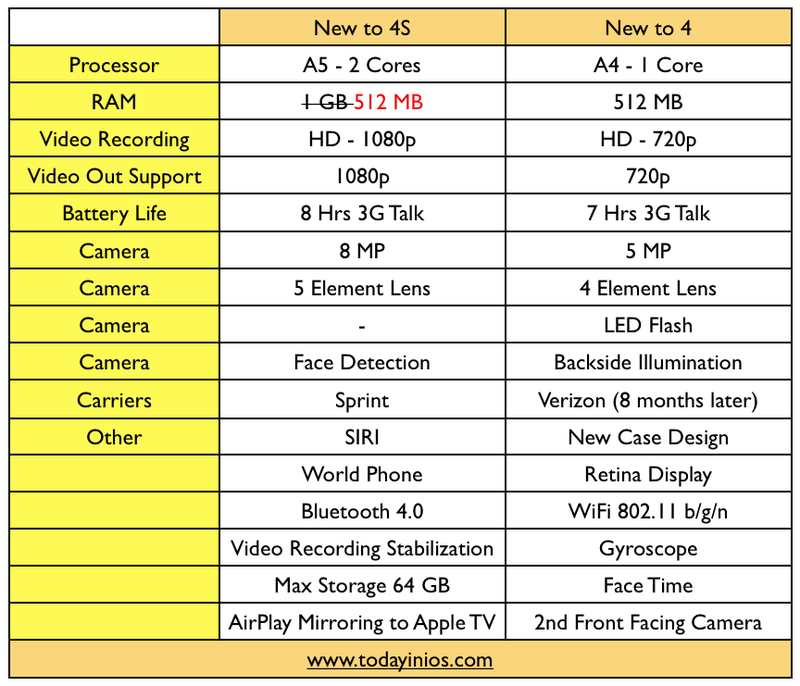 In aggregate all the new features on the 4S - when compared to all the new features of the 4 are on par as a min and IMO better than the 4. Again look at all the items in the left column and compare to all the ones on the right. Come on Kevin - I could say Siri is much better than Wifi being b/g/n - you can't compare any one feature to another - you have to look at them all in aggregate. I agree with you Rob. Sure, I would love to see a bigger screen and a redesign of the new iPhone but it didn't happen. I think the update is great when looking at specs and the performance increase with this iteration of iPhone. No need to be upset because it isn't the iPhone 5 because 4G isn't really here yet and we truly are at the intermediate stage of switching over to 4G. In the back of my mind, I was thinking about the iPhone 3GS and could they do it this time as well. I wasn't disappointed at all and I am very happy with the upgrades Apple made AND, in my mind, it really is the iPhone 4Steve. Looking forward to getting my new iPhone on the 14th of October and I have just as much excitement in anticipation as though iPhone 5 really came out. I for one am glad that they kept the 4 design. It's a classic. There is no reason to throw it away for the sake of trying to please a bunch of people who would complain about the new design as well. Ditto. I don't want a bigger screen because I'm afraid they would increase the size of the iPhone which in my opinion is the "perfect" size right now compared to other smartphones which are becoming the size of tablets. I want the sleekness of the iPhone 4/4s which is the best design ever on my hip!